Delevingne, Kloss, and Smalls appear on the cover of the September 2014 issue of Vogue magazine. The magazine also includes a pullout version of the cover with six other models. 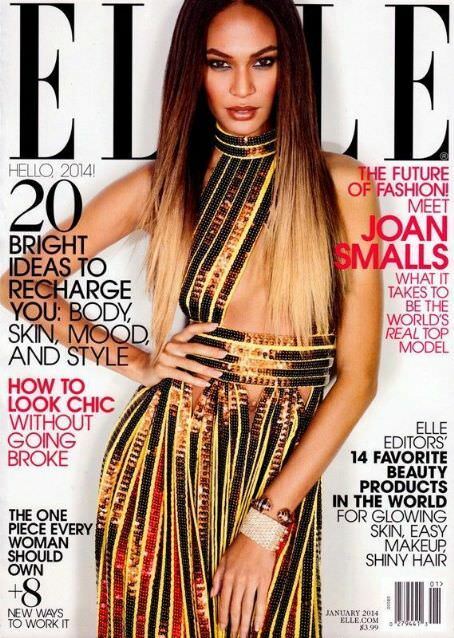 Smalls appears on the cover of the January 2014 issue of Elle magazine. She talks about the fashion industry’s lack of diversity, starting her modelling career, and wanting to get into acting. I want to be clear that I don’t want to act just because it’s the typical move for a model. My desire comes from a place of wanting to entertain people on a different level. Elle Magaine interviews Smalls about why she started modeling and why she chooses to live in a separate town from her job. I came to New York with a dream. I came to do what I saw girls doing in campaigns, in editorials great things, challenging things. I like to detach myself from work, to be able to go home and switch it all off, but I like looking into the city.